Motorcyclists today have a tremendous range of choices. Even if you want retro-style, you can find a reasonably priced new bike with authentic looks backed up by modern technology and solid reliability. This week we are taking a look at two such bikes on the market, beginning with Triumph’s Bonneville (to be followed shortly by a review of the new Moto Guzzi Stone). The first Triumph Bonneville was introduced in 1959 (the T120). Early British bikes were not known for their reliability, but Triumph continued to refine its design, and the Bonneville significantly increased in popularity by the late 1960s. Sales of the Bonneville began to decline in the 1970s with increased competition from the Japanese. As the old Triumph faded and died, a British industrialist named John Bloor bought the rights to the marque and re-launched the brand in Hinckley, England. A Bonneville model was released in 2001 displacing 790cc in a parallel twin configuration like the original bike. Eventually, displacement was increased to 865cc, and carburetors were replaced with fuel injection in 2008. There are currently three versions of the Bonneville available, but we chose to test the standard Bonneville that comes with relatively light cast 17″ wheels that allow the fitting of modern tubeless rubber. Together with a single front disc brake 310mm in size (squeezed by a Nissin two-piston floating caliper), the Bonneville has pretty low reciprocating mass in its wheel systems (the tires are slender 110 section and 130 section units). The result is a light and nimble feeling bike. 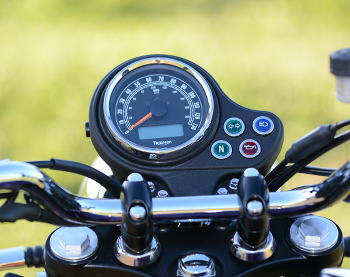 The standard Bonnie lacks a tachometer, but the big twin sends plenty of signals to the rider about when to switch gears on the five-speed box. With a claimed 67 hp at the crank (roughly 58 at the rear wheel), the Bonneville has a healthy, flat torque curve that delivers surprising thrust from as low as 2,500 rpm. The bike pulls well across the band before hitting redline at 8,000 rpm. Vibration is well controlled considering the parallel twin configuration and 360 degree firing interval. The air/oil cooled DOHC motor has plenty of power for two-up cruising, and Triumph offers plenty of accessories (windshield, bags, etc.) to transform your stock machine into a capable long distance hauler. Riding the Bonneville was very enjoyable. The bike feels much lighter than its claimed 495 pound wet weight (with 4.2 gallons of gas). It is low and compact, with a seat height that allows even the shortest riders to place both feet flat on the ground when stopped. The narrow tires certainly add to the nimble feel, but still provide decent grip for big lean angles when aggressively attacking the corners. For a single disc set-up, the front brake offers surprising power, together with decent modulation. The suspension is firm enough to avoid dive and squat, and we had no complaints with the fork. The rear twin shocks, however, transfer sharp bumps harshly, at times. The only adjustment available on the suspension is rear spring preload. The ergonomics are comfortable if a bit tight for taller riders. If you are long legged, you may lack for leg room, but most riders won’t complain. The seat is comfortable for shorter rides, but starts to feel hard and uncomfortable after an hour or so in the saddle. 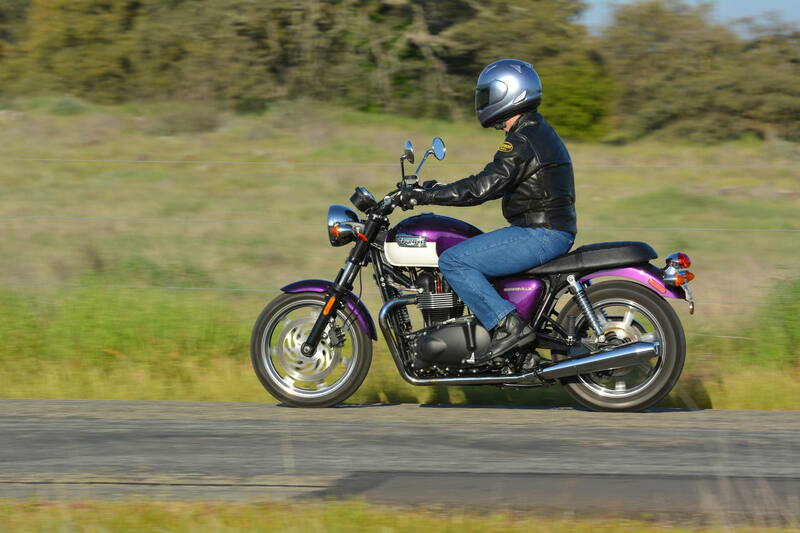 Of course, Triumph and third parties offer optional seats for the Bonnie. At a U.S. MSRP of $7,699 ($7,999 for a two-tone paint job like our test unit), the 2013 Triumph Bonneville is a lot of motorcycle for a reasonable price. You get retro styling that is very appealing to a large group, but you need not sacrifice modern performance in the bargain. The torquey motor, coupled with the lightweight wheel/tire/brake combination, offers a punchy riding experience and quick handling that never feels twitchy. The bike has been around long enough now that reliability issues should be well sorted. If you like standard-style motorcycles, and the styling appeals to you, the 2013 Triumph Bonneville is worth a close look. Take a look at Triumph’s web site for additional details and specifications. I sold my 04 T100 a year ago because as my wife said…”you can’t ride 2 bikes at the same time!” I chose to keep my Burgman 650 because that was the bike I rode the most. I regretted my decision almost straight away, and 1 year on I still miss my Triumph. or 50 years ago and we would both talk bikes for a while.At traffic lights guys in cars would wind down their windows and say “nice bike”. With the Burgman nobody gives a s#*t.
I think that is what I miss most about my Bonnie! I will advocate for the Bonneville/T100 to whomever will listen; perfect for me at least who needed something for his only vehicle that was entertaining at 10mph over the limit. This is my 11th bike, and I was tired of only using the top half of my previous machines’ powerband 5% of the time, yet going through tires/chains/sprockets/etc like I was using all those ponies all the time (can someone explain to me why that happens?). Even the 790cc I demo’d maybe a decade ago had enough squirt to plant the seed, so when I sold my Magna to my brother, I found a deal on a year old 865cc standard 2007 in a crate, put another couple grand into mods, and now have 76k trouble-free miles on my favorite bike ever. The best thing about these bikes is how they can be whatever you want; witness how mechanically similar the Thruxton, Scrambler, and Bonnevilles all are. At the extreme end they’re even popular platforms for custom bobbers. If I ever retire this one I may go that route, or mount a sidecar, I haven’t decided yet. I’ve ridden the newer ones with the 17″ wheel & yes it does handle more like a modern sportbike, but I’m fine with the more relaxed steering 19″ front still found on the T100. Someone told me that my Union Cycle wheels are made by the same firm that made them for the Meriden factory, which is pretty neat if true. Once I discovered dualsport tubes (Michelin Rennforce) I haven’t missed tubeless tires, & get about 12k per set of ME880s (the slightly larger than stock 140mm rear mounts just fine). Mine also has a Parabellum Scout fairing, Leatherlyke contemporary bags, some Triumph accessories the dealer threw in ($1000 incentive on the non-currents that year), and some other farkles from the likes of NewBonneville.com, BritishCustoms.com, Bonneville-shop.de, etc. I wouldn’t turn down a seat upgrade if someone chose to give me one, but even the stock saddle is okay for a full tank at a time once it’s broken in. All I’ve done to the motor is D&D slipons, dynojets, K&N filter, AIS blockoff with emissions plumbing jettison (passed emissions just fine back when AZ still tested bikes), & a snorkelectomy. Progressive fork springs, Ikon shocks, 17-tooth primary & 43-tooth final sprocket (both steel, do not buy aluminum! ), EK SRX x-ring chain, & EBC HH brake pads round out the performance mods. I get mid- to high-40s mpg in mixed riding, a few less when I get the wild hair to mount the Dart flyscreen instead of the Scout, and with 4 gallons of midgrade in the 4.4 gallon tank (the top 0.4 gallon must be above the bottom of the filler neck, as it takes exactly 4.0 gallons to refill the tank when it’s been run dry – damhik), cruising range is quite acceptable at around 180 miles. I owned a 2001 for a while, picked it up cheap and it had to compete with a Multistrada for my riding time (it didn’t make the cut). I sometimes wished I had kept it. my wife (5’4″ 120) started riding last year and is now ready for a “real” motorcycle. The Wolf Classic has been a barrel of laughs but it’s time for her to experience the performance of a real bike. I think the SE is at the heavy side of the spectrum, but the seat is low. It looks good enough (needs the brushed engine side covers IMHO, and I like spoked wheels). I think she is a retro fan (i.e. loves the W650), her reaction to the CBR250 and Ninja 300 is kind of “meh”. I think the new CB500’s are interesting but a little mixed up styling-wise. I guess we wait for the Honda’s before deciding. I bought a 2009 Bonneville SE new. I have 15,000 trouble few miles on it. It is still all stock mechanically speaking. I just added a wind screen, sissy bar, a few minor detail stuff, and I still have the stock seat. I think the bike is just about perfect. For a newbie the Bonneville is easy to ride, and handle. I have been using it for committing, all day trips, and a few over night weekend trips. It has been a blast to ride. And quintessentially I am planning to ride it to Alaska this summer. I owned a 67 Bonneville in 1969. It is a perfect design combined with memories from those magic years against which logic has no chance. Every spring I ride to the dealer and take a test ride. A few years ago when I rode my late 90’s KLR 650 to the test ride. I realized on the way home it was better in every way. Handling, comfort, gas mileage, versatility. Yes it’s ugly, but I can’t see that while I’m riding. The Bonneville will always remain in my heart like my high school promo queen. An object of lust and delicious fantasy combined with deep gratitude that I never married her. A nifty Bonnie to have would be a Thruxton styled bike with the T-Bird engine. I’d be all over it like the smell of sulfur on George Bush. Regarding the ergos on the Bonnie, one has to remember that there is a difference between seat height and the seat-to-footpegs distance. I have a 650 VStrom which is a very tall bike, but the seat to footpegs distance is a bit tight, but not too uncomfortable. The only way to relax the seating position on any motorcycle is to either lower the pegs or install a taller seat. Or both. Back in the day, most of the “standard” motorcycles had a seating position similar to today’s Bonneville. Love it or leave it I guess. I love it. Reviewing the Guzzi V700 vs the Bonneville. Guzzi is much lighter, and has a gas tank/mileage good for almost 300 miles. This is quite remarkable. The little it gives in power it gains in weight savings (and therefore better handling or pickup after a spill). Once again a bike I will not be buying because motorcycle manufacturers have decided that it is more important for short people to put “both feet flat on the ground” (really? You ride a bike but you cannot put the thing even a little bit on one side?) than it is for tall people to actually ride the thing. So, bye-bye Bonnie. Totally agree. A year or so ago I went to the motorcycle show in NYC and sat on a bunch of bikes. They were all horribly cramped for just that reason. Are short people somehow the majority of the market? All the bikes have low seats, but to get decent ground clearance, the pegs are high. So at 6’2″ I end up folded like a pretzel. Give me a tall seat, please! Or at least an adjustable one. Not all riders are 5’6″! Even some of the “adventure-touring” bikes are like that. A low seat is NOT a selling point! Let me solve this apparent mystery for readers. The fastest growing demographic for “disposable income” is females. Beyond the basketball court how many women have you met over 5’9″? How many of them ride motorcycles? I believe the western motorcycle market shrinks. The growth market is Asia and possibly BRACS. Met many 6′ women from that neck of the woods? Believe me, I sympathize. I love bikes, am 6-3, and the best fitting bikes ever for me is KTM’s 990 Adventure. Yeah, my best fitting bike is a DR-Z400SM. A KTM Adventure would probably fit nicely too. What you’re saying makes sense. I think the solution to this is adjustability. It shouldn’t be that difficult to make seat height adjustable over a meaningful range (at least 4″ or 6″). And suspension height should be adjustable too. +1000! I’ve been advocating this for years but it “interferes” with the designers’ vision. Seems bicycle manufacturers can provide all sorts of frame sizes (both step-through and top-bar) without much fuss so what’s the big deal with providing different motorcycle frame sizes? Adjustable handlebar height/reach (again, think bicycles). Motorcycle seats that are anatomically correct (think bicycle “cruiser” seat or any aftermarket long-distance seat manufacturer). Funny but us shorter folks feel the opposite, so many bikes are too tall – adventure tourers, enduros.. But I’ve also noticed that some larger bikes (like the VFR1200, Bandit) put the footpegs way to high, causing cramped rides for everybody it seems. Offer a 650 cc and 1,000 cc engine model. Zero maintenance hydraulic valve lifters. Tach comes as stock item. Offer a locking fuel tank with fuel level gauge info. Hinged lockable seat for easy access. Center stand as stock item. Zero maintenance rear belt drive with fixed axle and belt idler pulley. Incorporate locking front end into ignition switch. Match exhaust system to the 1966 Bonneville for sound and look. These are all doable items that will improve ownership of this motorcycle. JR: Too bad that you didn’t pick up one of Kawasaki’s W650 models when they were sold here in 2000-2001. Other than the hydraulic valve lifters and belt final drive, the W650 had most of the other features you suggest. I have owned a W650 for 12 years now, and plan to keep it forever! JR, I like the idea of hydraulic valves. Don’t see why a 650 would be marketable (a 1000 sounds good though) Tach (really isn’t needed on them unless you;re really beating it)Locking fuel cap, gauge, etc gets away from the bare bones, retro thing and I certainly haven’t missed them on mine. I rode a Speedmaster with a belt set up and it was nice. I’d go for that. 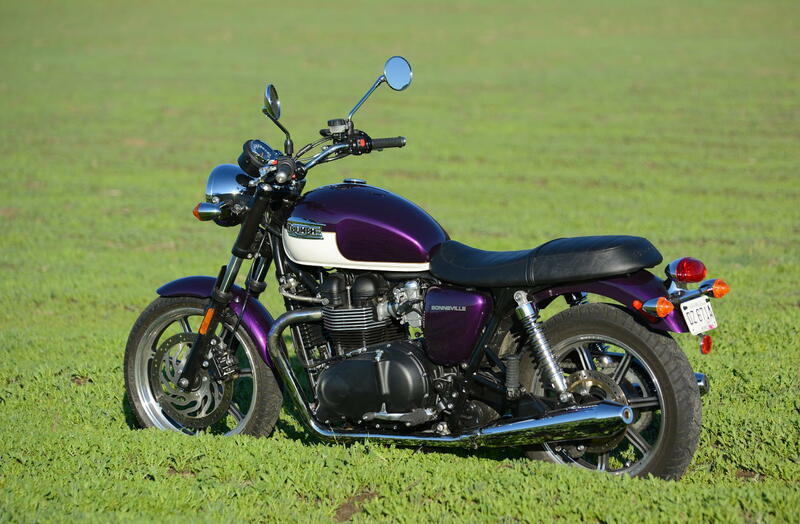 With regards to the color, the 67 Bonnie was Burgoine ( purple) and white in basically in the same pattern as above and undoubtedly one of the most beautiful Triumphs made imo. I lusted one for years. However, the 67 had stainless polished fenders and a silver motor with black cyliners, black side covers and black fork gaiters. The purple was just on the tank. This Bonnie above is overall too dark with too much purple. one of the model years of suzuki’s triple 2-stroke water buffalo from the 70’s had a purple paint scheme (albeit a lighter shade me thinks). almost a candy color. absolutely gorgeous. Great bikes. I had a 76. Loved it. Back in the old Coventry days of Triumph, one of the more popular colors was Amaranth Red. I don’t find it a very pretty bike. I’d get the Kawasaki W800 if it were avaialable in the USA. The Bonnie Scrambler is nice though. I have a 2007 Bonneville Black. Bought it new and really like it. Bad; seat, shocks. Good; I replaced both and have a very balanced all-round bike. I think certain parts are cheap because Triumph is trying to keep cost down. On the exhaust. In a perfect world I’d love the stock pipes. They are very functional and quiet. But, I’ve used my aftermarkets more than once to get some idiots attention who a bout to crush me while he happily chats on his cell. Straight pipes that break store windows, no. Loud enough to let people know you are there, yes. Also, the horn doesn’t work as well as the pipes! I’ve toured, commuted, and had just plain fun on the thing and it’s a good value too. Color me happy! Twelve years ago after a long hiatus from riding I bought a 2001 Bonneville, which now has 78,000 miles on the clock. I paid $7000 at the time. I will never sell it. It is a gentlemen’s bike with enough power to give you a thrill but not so much to get you in trouble. The ergonomics are excellent (and yes there are many choices of 1″ bars) though as noted the seat will test you if you are going out for 200 plus miles. It is perfect backroad and commuting bike and will run at 70 plus comfortably all day long. I consistently get 49-51 mpg unless I’m doing 80 on the highway. Curvy road in 4th gear at 45-60 is bliss, with excellent engine braking from the twin. Not the bike you’d drive to Alaska, but 90% of the time, just right. The bike has been nearly flawless mechanically, with only a leaking fork seal and a sticky rear brake caliper in all that time. The build quality has far surpassed my expectations. It just runs and runs and still puts a smile on my face. All I do is keep replacing what wears out. Just replaced the clutch with a Barnett unit; very nice. At the time I bought it there were about 6-8 total accessories for the bike but over time the assortment of performance and cosmetic mods available has grown nicely. I upgraded the suspension long ago with Works springs and Ikon shocks, replaced the front caliper with a 6 piston PreTech unit, switched the pipes for off-roads, added Nology wires & coil, K&N filter and switched out the drive sprocket for an 18 tooth. I’ve been through a few windscreens and now have a Givi unit that is just perfect. There are many, many cosmetic goodies available as well but I’ve put my money into performance first. That said, the bike is just beautiful, with a unique look that defies categorizing and people will stop and ask about it all the time. Here’s someone who get it. I owned a 2006 (carburetted) Bonnie for awhile. The bike was really a mix of good and bad. It was a really pleasant ride that made all the right sounds and looked beautiful. It was black and red, and that is still the prettiest paint they ever put on on a Bonnie, IMO. I had the off-road pipes, and I was able to rejet the carbs myself. Now it’s a bit more expensive to have your dealer reprogram the FI if you want to change the pipes. The suspension was terrible, as was the front brake. I think the front disc is now improved, with the addition of the brake from the Thruxton. I replaced the rear shocks with adjustable units from a Kawasaki ZRX1200, which transformed the handling and eliminated the wallow in mid-corner. The seat was miserable. Gas mileage was poor, and with the small tank, I was searching for a gas station at about 100 miles. On the positve side, it shifted as well as any bike I’ve ever owned, but it really needed a six speed. I wish Triumph hadn’t put one inch bars on the bike, which would have made it easier to find replacements for the stock bend, which were reminiscent of an old Honda CB350 bend. I would really like to see Triumph treat the Bonnie like Ducati did with the GT1000…modern brakes, suspension and performance. The GT1000 certainly evoked the essence of the old GT750, but the rider didn’t have to put up with so many shortcomings. I eventually sold the Bonnie, preferring to ride my Tiger and Speed Triple. The poor old Bonnie just became a hanger queen. The Thruxton is more like the Duc in this case but I couldn’t ride the Duc because of the ergos and the same goes for the Thrux. 9they are fun though) You are correct about the suspension but like you said, a new set of shocks makes a huge diff. I actually replaced my seat with a later model one and the foam seems much better. I went up one tooth on the C/s sprocket and mine cruises fine at 75. (above that you’re fighting the wind without a fairing so what’s the point?) The 1″ bars do have lots of options btw. If you want a British parallel twin that performs like a Ducati GT1000, the fellows over at Norton would love to talk to you! I own a few Triumphs. Two newer Bonnevilles and one Tiger 800 XC. Two totally different bikes of course. The Bonnies……..what fun, fun to ride on the backroads in NoCAL. Seems made for them. I liked my 2005 Black Bonnie so much that I got a 2007 T100 and put a Dnepr sidecar on it. I’ve done 400 miles days on the stock seat with no issues at all. Replaced the shocks at an early stage with IKON shocks. Better than stock. Ohlins would be best tho. Both have the Triumph “Off Road” pipes and re-jetted for them. (Pre fuel injection). I’ve even tried a set of stock 1969 Bonnie pipes on the 2005. Nice but a bit louder than it should be. The Tiger 800XC……much taller. Much faster. Much better suspension than the Bonnies or Wee Strom we have. Great bike. 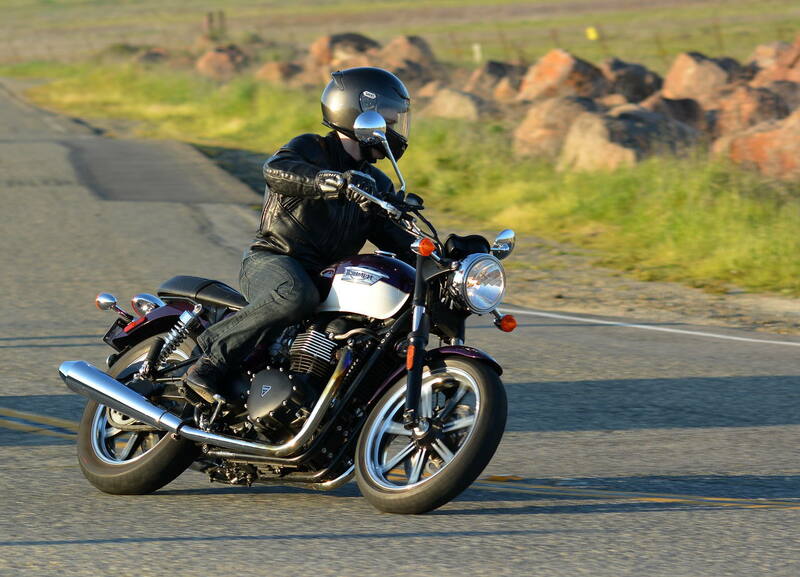 The Triumph Bonnies tho………..Just feels like the “old days” with modern electrics and motor. Serious cool factor. Lots of smiles per mile. A question for Dirk and Bonnie owners, what kind of milage are you getting? I got about 40 mpg with my carb version. I’ve heard the FI models are similar. 45-48 after the rejet. 150 miles about before it goes on reserve. With my ’11 (w/fuel injection): 39 – 41 city, 48 – 51 highway, and I average 46mpg after 2 years/12,500 mi. 45-ish in stage two tune (pipes/filter/jets/airbox mod). I hit reserve right at 142 mi more often than not. This is a 2007 Std w/ 76k on the odo. Purple is a traditional Bonnieville color. Fortunately it’s also offered in other colors. True. In high school my GF’s cousin had a purple ’67 T120 which he would occasionally let her and I borrow. I owned a CB160 at the time, and it was quite a step up in performance! im sure that looked hideous as well! Not so much. See Mickey’s comment above. There was only purple on the tank. 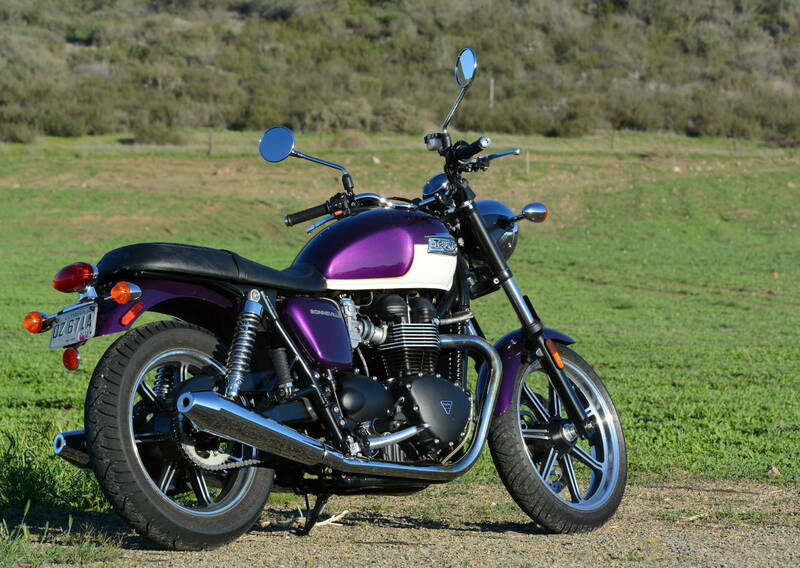 The acres of purple on the side covers and fenders on this Bonnie are over the top. Actually, I like that colour. Agreed, on the matte black (or any matte finish) thing. I never liked it in the first place, and now that it’s showing up on practically everything I really have grown to despise it. That’s one styling trend that needs to die a quick death. I’m no big fan of the purple there, but I’m okay with it since they do also offer a few other color choices. I can see its appeal for certain nostalgia buffs, female riders, and just anyone who wants something different. I bought a T 100 Bonnie in 03. Thoroughly enjoyable motorcycle if not a little under powered and under braked. Motor and electrics were stone reliable for the 20,000 miles I owned it before selling it to my younger brother, and for the 10,000 he has ridden it since. Haven’t even had a valve go out of spec yet. I did replace the stock pipes with Triumphs off road pipes, and added fork boots off a w650 Kawasaki, and a Triumph grab rail and my brother added the centerstand. I love the retro bikes and test rode a Moto Guzzi Classic 750 but it is really anemic even compared to the Bonnie. I recently bought a Honda CB 1100 retro and it is a wonderful motorcycle with stunning good looks, plenty of smooth power and great brakes. Just what I was looking for. Triumph purists will tell you the proportions on the new Bonnies are all wrong, the tank too bulbous, the pipes are wrong, and they are right, but that wont stop people from coming up to you at every stop and tell you about the Triumph they had back in the day. The bike really draws a crowd. Okay, I forgot to mention the CB1100 in my little story. Had that one been available, I would have bought it. After reading up on the Intermot show and the lack of any news indicating Honda would bring the CB1100 to the U.S., I gave up on it. A month or so after I bought the BMW I read on this site that yep, Honda had announced that they were in fact finally bringing the bike to the U.S. market in 2013. Still, I guess I’m okay with how things turned out. I know my bike is actually ‘better’ than the Honda in most every measurable way, even if the Honda is more appealing to me. I think you would find more people choosing the Honda over this if given the choice. Doesn’t make the Bonnie bad or that one can’t nick pick at the Honda but I just think Honda’s offering covers a broader range of riders. “Better” is often subjective anyhow. I bought a Bonnie back in 2005 or 2006. A 2002 Aniversary Edition, I didn’t ride it but down a street and back until I got it home to Maine. (it came from just south of Erie, PA) The first toot around the home stomping grounds was an eye opener. The Bonnie’s motor is by far, one of the nicest motorcycle powerplants I’ve ever been on. (and I worked in bike shops all my life and have ridden plenty) It still brings a smile to my face when I run it up through the gears. Mods? Staintunes, rejet, up one tooth on the C/S sprocket, Nology coils, flyscreen and Ikon shocks. The motor pulls good. the Ikons made a night and day differece in both ride and handling and I can sit and it makes me smile when I sit and have a beer with it in the winter. I’ve ridden the BMW 1200s and I’ll take this over it any day and Sunday. Not that there is anything wrong with the BMW, it’s just there is so much right with the Triumph. In an effort, I’d presume, to promote the purchase of optional, lower-restriction pipes, Triumph has fitted the Bonneville with highly- restrictive, pitiful-sounding exhaust canisters (“silencers”). So, you might as well plan to add $500 – $600 for pipes + retune, which noticeably improves engine response. Also, on my ’11 Bonneville, I lived with a starter motor glitch causing intermittent problems for nearly 2 YEARS, which was only recently solved through the help of a savvy triumphrat.net member providing relatively-simple instructions my dealer used to rewire the ECM (under warranty). Triumph is certainly well-aware of this intermittent problem common with their parallel twins, yet offered no helpful advice. They should, by now, have modified the ECM for new bikes — but, I’ve noticed owners of ’12s and ’13s posting with the same problem. Otherwise, the bike has been a pleasure to own and ride (w/12,500 mi, now). Light-handling, as Dirck said, with a wide power band and beautiful sound (w/ my Norman Hyde canisters, at least). Any after-market shocks, such as my inexpensive Hagon units, will help with the standard-issue, fairly-harsh ride. I know everyone always rips the overly quiet sound of the stock pipes on the Bonneville, but I was fine with it. Kind of a cool little burble, in keeping with the ‘understated gentleman’s ride’ theme. I would probably leave them alone, but I would certainly end up ditching the shocks for something better. I’d probably opt for the Triumph gell seat too, along with the center stand. I didn’t see heated grips listed as an available option, but that would also be a definite for me. Yeah, I was (almost-) fine with the sound for the first 1,000 miles, or so. But the engine felt like it was being held back, very noticeably, between 3,000 and 4,000 rpm. The replacement canisters + a richer mixture greatly improved the engine’s eagerness to rev. No heated grips are offered, to my/our chagrin. Well, since I felt the one main flaw of the bike was its relative flatness off the line (right in the rpm range you mentioned), okay, perhaps I would end up swapping pipes/fuel mapping. Beef up that low midrange and swap out the stock shock and perhaps the seat too and yep, you would certainly have yourself one nice little bike there. ‘Not to drag this out, VLJ, but… it is still “flat” from a standing start, compared to the V-twins I’ve owned. It IS fine over 2,500 rpm, though, and great between 3,000 and 7,000 rpm. I own two Triumphs and love them both and if I could I would buy two more, this being one of them. 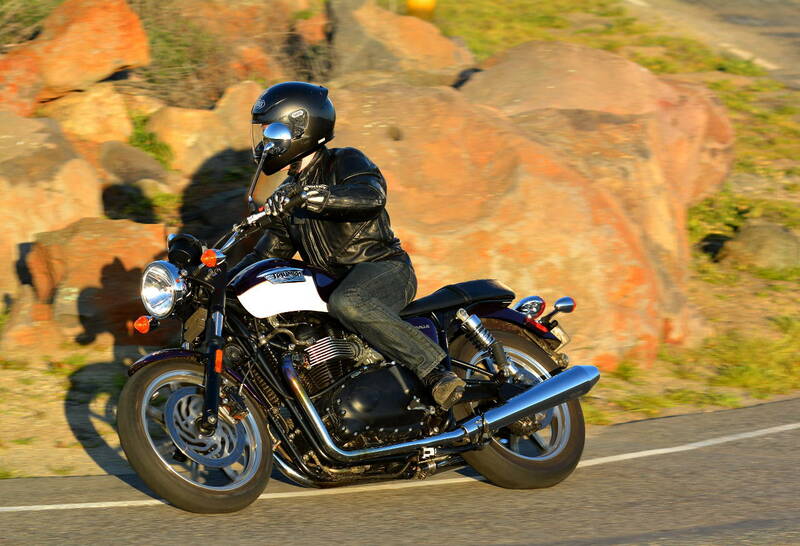 The Bonneville is indeed a great bike for a good price. Simple, affordable, modern, reliable, and classic, perfect for the rider who is returning after many years of not riding. I have often wondered why Victory and HD, haven’t tried to compete if this segment. …and HD, haven’t tried to compete if this segment. Your kidding us right? HD makes most everything except maybe the V-Rod just about the same as it’s done for years. What HD bike is $8K ? I agree they haven’t changed much over the years, so modern is questionable. A harley Sportster super low. But I wasn’t refering to price as I didn’t think you were. When it comes to the Bonneville, that 17″ front wheel simply looks out of place to my eyes. Still, between the different Bonneville iterations, the variety of Moto Guzzi V7 models and now Honda’s CB1100, there are some really nice choices out there in the standard market these days here in the United States. Maybe the Kawasaki W800 will turn up to the party soon. Good stuff. Agreed on the 17″ front wheel. I can appreciate that it helps make the bike steer and handle like a modern one but the look is not right. It would be like putting a 16″ wheel on an RD400. The purple paint is fine to me but the tiny front wheel just isn’t right for a Bonney. An 18 would at least get the front to rear stagger right but I’d prefer a proper 19″. This was the bike I targeted when I decided to get back into motorcycling following a long bout with cancer. I told myself that I physically and financially could not afford to crash, so I needed something that would not only force me to slow down but, even more importantly, allow me to enjoy riding at that more sedate pace. No cruisers for me, though. Never. Initially it came down to the T100, the Bonneville, and the Moto Guzzi V7 variants. Of the three, I most preferred the looks and basic idea of the Moto Guzzi. After test riding them all, however, I decided that the V7 simply would not give me enough freeway power to keep me satisfied once the novelty wore off. It sure was great around town, though. Stellar torque right where you want it for city riding. The basic Bonneville with the 17″ front wheel and lower/closer bars handled so much better than the T100, but I came away from that ride questioning whether it too would soon leave me wanting. So, back to the drawing board. Time to look again at the Street Triple and Tiger 800. I ended up ruling out the Street Triple for my original reason: Slow down, you moron! You know you won’t be willing to dial it back if you get that thing! The Tiger 800 just didn’t fit me as well as I would have liked. It felt too similar to my old V-Strom 1000, which was always a bit too tall and unwieldy. So, back to the Bonneville. The day I went in to buy it, the store’s internet guy rolled out my real first choice all along, the BMW R1200R. I had long since ditched that idea simply due to the cost factor. Lo and behold, though, this one was the right color and it was a barely used/like new 2012 model with almost zero miles, at a somewhat do-able price. Having had one before, I knew what it would be. I wouldn’t have to worry about it being too underpowered once the novelty wore off. So, that’s what I bought. That Bonneville, though, I still do like it. It was actually pretty nice on the freeway, which was the one place where I expected it to be miserable. Not at all. It was plenty smooth enough, and the windblast was acceptable for a bike of that type. It also does steer really well. It’s such an easy bike to maneuver, plus it just plain looks good, particularly in black. It could sure use a little more off-the-line grunt, but overall I’d have to say that it’s one of the two or three bikes I would most recommend to any newbie rider or any re-entry rider who just wants a simple, easy-to-ride motorcycle as opposed to a two-wheeled ego display. It’s fun, and it’s relatively pure. For a lot of people it’s what motorcycling is and ought to be about. I would still love to own one. I have had a Breva750 for 9 years and it’s reasonably decent on the motorway – I cruise at 75 by preference. But then again I try and avoid motorways unless I have to take them. Had her up to the ton fine. I liked your post because I too considered the Bonnie but at the time the exact model mix didn’t suit me. It’s far too late now to change – I’m a Guzzisti now through and through 🙂 Commuting touring fun rides, the 750 is a sweet engine if you ignore the numbers and just ride it. Yep, I definitely wanted to like the Guzzi the most. That was the one I was hoping would win my little shootout. Man, I love the idea of owning a modern Guzzi. It’s such a cool thing. Aside from the somewhat underpowered motor, though, there was also the issue I had with the seating position: namely, I found myself sitting on the rise on the seat, right where the strap is. I’m not even tall or long-legged, either. In the end, as much as I loved it, I just decided that it wasn’t quite enough bike for the way I ride.